The Samsung Galaxy S5 is many things rolled into one. As if being a fitness monitor and a regular smartphone was not enough, the phone has a hidden feature – it becomes a baby monitor, given that you have an accompanying Gear smartwatch and also, your phones lies near your infant. 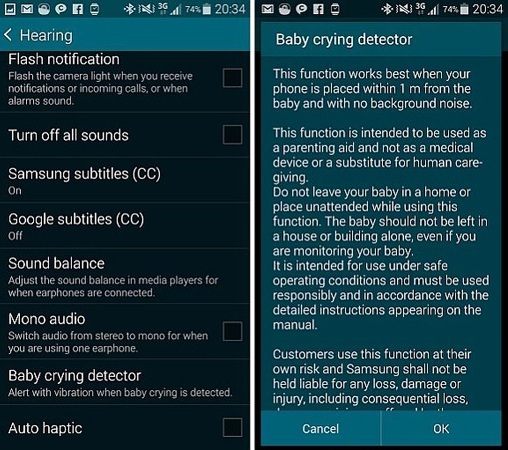 In fact, there is a ‘baby crying detector’ hidden in Samsung Galaxy S5 accessibility menu. How it works is it uses the Galaxy S5’s microphones to detect your baby’s cry and sends a vibrating alert to your Samsung Gear smartwatch, which it is expected would be paired with your phone. While this feature hasn’t been tested by anyone as yet, it sounds cool. Obviously, you can’t leave your phone around your baby all the time and even if you do, it might ring and wake it up, undercutting the whole point. But it still might be useful, if you have to do other work in the house and don’t want to leave your baby unattended.